Tart Cherry Juice: Fad or For Real :: Be Broncho Fit! In today’s society, stress is an everyday occurrence that people deal with in a variety of ways, healthy or unhealthy. Chronic or long-term stress can cause many problems psychologically and physically. Having healthy ways to deal with stress is an important tool for any individual. One way to help relieve stress is to be more active in your lifestyle by exercising regularly and moving more often. 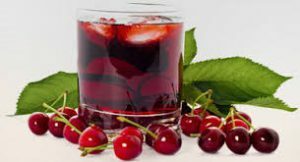 While there are several different strategies and mechanisms for dealing with the effects of stress, one new method is drinking tart cherry juice. Here is a little bit of information about how tart cherry juices can affect your body. Stress is necessary to grow but too much can leave you feeling drained, so many people look for productive ways to reduce stress. Tart cherry juice may be one of those ways. Research shows tart cherry juice may be beneficial to a long list of ailments, as well as boost exercise performance due to its anti-inflammatory properties, Antioxidants, and Melatonin. Tart cherry juice has been found to be helpful with gout and muscle soreness and can help with increases muscular strength. Berries which deep rich colors are full of antioxidants and help with recovery after exercise. Tart cherries are also rich Melatonin which helps to regulate sleep and mood. Tart cherry juice has been found to reduce uric acid and inflammation throughout the body. You can never have too many methods for reducing stress and tart cherry juice may be one of those methods.